Furthermore, there is already a light such as thrunite Catapult V6 like that, how could Sofirn makes it better? If you put a CSLPM1.TG in the Catapult V6 host, it will throw much farther with only a small drop in lumen output. If you guys want tell new ideas for Sofirn light, please just PM me, but contact aliexpress sales only for order related topics. Simple and clear communication helps us making acurate plan. Easy. Make turbo in the mode sequence and so that turbo can be memorized. In Modes, the difference between memorized and non memorized turbo is practically nothing. Single click for memorized or double click for non memorized. The extra click bothers you? I notice that in Ramping you can memorize turbo. But Catapult has 12v boost driver, will it work with 3v led? What he is trying to say: “If you put a CSLPM1.TG in a host the size of a Catapult V6, it will throw much farther with only a small drop in lumen output. 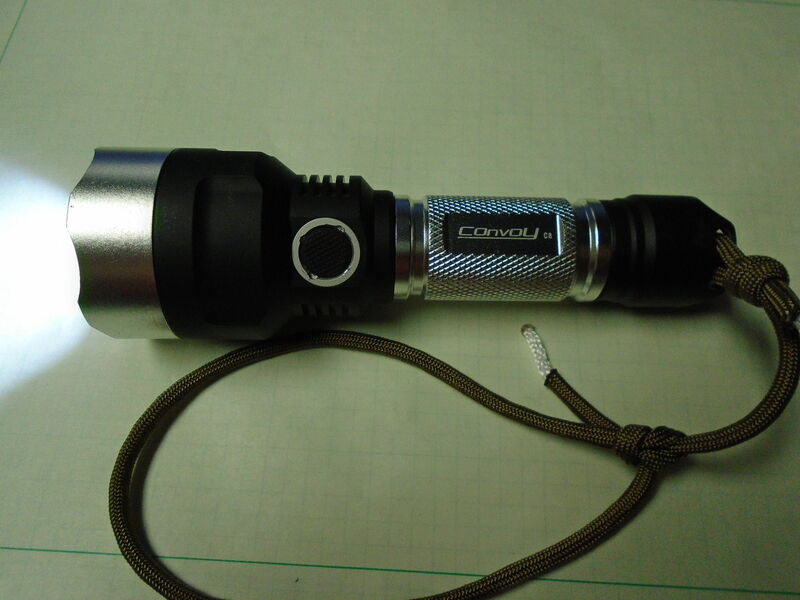 How many people like C8F with 3* SST20 4000K 95CRI？It will be quicker and easier. I know some say a single XHP family + bigger head + 21700 tube or 26650 tube light gives 15k+ cd, it’s a new light which takes longer time to fulfill. Late to the game on this, but was there a reason for the dual switch? I’d be interested in a single side e-switch C8F (21700 triple) ideally with Anduril Having the single switch would enable it be slightly shorter too. Does something like this already exist? I don’t know anything about the XHP, but SST20 4000K 95CRI would be nice, especially if tint was below BBL. Late to the game on this, but was there a reason for the dual switch? It works with the unique UI. You can operate the light as if it were a single e-switch only, or you can use the rear switch to turn the light off which would then allow you to turn the light back on at the previously-used level using the forward clicky switch in a tactical way. For instance, flashing Morse code, etc. I'd like to see a C8F 21700 (triple) come with an SS bezel and no tail switch, so the overall length is reduced, as hodor mentioned. All my C8F's are getting an SS bezel anyway, and the tail switch with either a NarsilM or Anduril driver is not relevant, and part of the advantage of having good e-switch firmware is to remove that switch. Maybe Sofirn can make a replacement endcap with no switch available? I’d like to see a C8F 21700 (triple) come with an SS bezel and no tail switch, so the overall length is reduced, as hodor mentioned. All my C8F’s are getting an SS bezel anyway, and the tail switch with either a NarsilM or Anduril driver is not relevant, and part of the advantage of having good e-switch firmware is to remove that switch. Maybe Sofirn can make a replacement endcap with no switch available? I’m indifferent about SS bezels. Sometimes I think it looks nice but most of the time I like the clean uniform look of non-SS bezel. Now, when I use the tail switch it turns on in the last memorized brightness. Basically, it acts like a normal forward switch but it cannot change modes or anything. It just comes on in the last memorized level it was turned off in. Yes, it does bother me enough for me to pass on many lights when turbo cannot be memorized or just not in the mode sequence. Just doesn’t make sense to me. I only see it as a safety precaution. But we re all responsible enough so why make it more work for the user? Some companies are now even doing double click for turbo, and then another double click for brighter turbo?! That’s way too much work to get to the brightest mode. I still like the double click to turbo at any time. But just make turbo memorized or in sequence. What’s the big deal with them. Some family members and friends don’t know about double clicking and just know to ramp up or change modes. So high mode will basically be the brightest mode for them, unless you instruct them. As long as you can memorize turbo in ramping, then that’s fine with me. I’ve seen those lights that make you dbl click for Turbo and then you have to pause, then dbl click again for Turbo S. Ah, such crap! The Olight X7 and X7R has that. With NarsilM v1.2 or v1.3 you can change the code (and then flash the mcu) to make the top of the ramp be less than 100%. In this case it’s no big deal to me, you can do a dbl click instead of a single click to get 100% Turbo. If you know how to reflash mcu’s or buy a driver from Texas_Ace or Lexel, then you can set the top of ramp to whatever you want. All of my custom built NarsilM drivers use v1.0 or older so they ramp to 100%. I’ve got the BLF GT, GT Mini and Astrolux S43S that ramp up to less than 100%. I don’t use any of those lights very much so them not ramping to 100% doesn’t bother me. The lights I use all the time I tend to set them at a mid level memorized setting and dbl click to turbo for short bursts. The only time a see a problem is if you have let’s say a 3,000 lumen light and you want to set it at 2,500 lumen, but can’t because the top of the ramp only goes to 1,800. That might annoy me, but I can’t think of a reason I’d set it that little bit below Turbo. 2500 to 3000 is not a very noticable difference. Maybe if the top of ramp was 1000 lumen and I wanted to run it at 1500 lumen, then I might get upset. This may not be perfect, but it’s still way better than non ramping UI where you have to cross your fingers that one of the brightness levels matches your needs. The UI Anduril has the advantage of having a user setable top of ramp. That’s the best of both worlds. You can memorize Turbo and access it with a single click. Does the Sofirn C8F 21700 battery tube fit onto a Convoy C8? I tried reading through posts and doing searches. I can’t figure out if the older C8F or the 21700 version is being talked about. 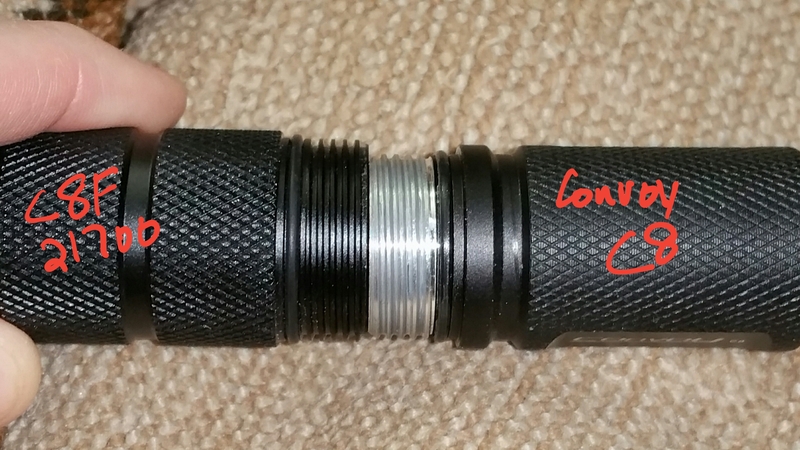 Do you mean, does the Convoy C8 battery tube fit the 18650 C8F? Yes, it does. The 21700 tube is obviously larger in diameter and does not fit. Do you mean, does the 18650 C8F battery tube fit the Convoy C8? I don’t know. Thanks for the reply. No. I mean C8F 21700 battery tube working with the Convoy C8 head. I know that bored out C8 exist that will accept a 20700 cell, with the o-ring being the thinnest part. So, it is close. No, it’s not close. I’ll take a picture of the two later today. I discovered that one of my C8F 21700 lights lacks a screw inside its head. Can anyone help me to find out the correct size of the screw I need for the center hole, i.e. the one that is behind the driver and that tightens the reflector and the MCPCB? M3 seems to be too large, so maybe it's M2.5? Is there a reliable source in Europe/Germany where to get the right screw? I used this schematic picture to show what I am looking for. Thanks for any help! Mine is a cheap phillips head. If I reinstall the reflector, I’ll probably replace it with a socket head cap screw of some kind. Whoops, looks like I forgot. Here are the two battery tubes side by side. Hmm, I just posted something on the S11 thread, saying that the 21700 seems closer in size to the 18650 vs the 26650. This is kinda the proof I need. Thanks for the pictures and update JasonWW. Wishful thinking on my part. I noticed that myself. Hoping that the upcoming Convoy C8+ 21700 has some thinner walls. I don’t really see the need for the wall thickness. If your going to add weight, it would be better served in cooling the head. It would be great if the C8+ 21700 body would fit into a 18650 C8 head. Maybe the dimensions are just too far apart. I contacted your company via email on two projects and got no senior response. FYI, Barry works for Sofirn and commented in your thread even. You are in for a huge disappointment and reality check if you expect constant and clear communication from these guys (nevermind it’s during a national holiday). Just set your expectations to this all the time.